Our biggest release since Property Hive was made available 6 months ago is here. This version, 1.1.0, contains support for recording and marketing commercial properties, such as warehouses and offices, to your users. Supporting commercial properties was a feature we got asked about a lot. Be it from estate agents that deal with both residential properties as well, or agents that’s sole business model revolves around commercial property. We’re so pleased to now say that we can support this, instead of suggesting workarounds like we previously had to. This key feature of supporting commercial properties is available as part of the free core WordPress plugin so there will be no additional costs required if you’re a new or existing Property Hive user. Simply activate the ‘Commercial’ department in the settings and the related functionality will appear within WordPress and on the website. Whenever we set out to build a new feature we want to be 100% sure we’ve understood the requirements and that we build it correctly. This is evident in this feature where we’ve been working closely with renowned commercial estate agents. – List a property as a whole or as individual units. This is great for when you have a block of offices, for example. You might want to list the entire block as one property, but then also list the individual offices available too. We maintain a link between all of the related properties and units making it easy to navigate between them and market them exactly as you like. – Mark the same property for sale and to let. In other systems we’ve seen, if you want a property to be marketed as for sale and to rent you need to add the property twice. In Property Hive you can do this on the single property record and then enter the relevant information all in one place. No more duplication. – Floor area, site area, price and rent. For all area and price related fields you can always enter ‘From’ and ‘To’ values. 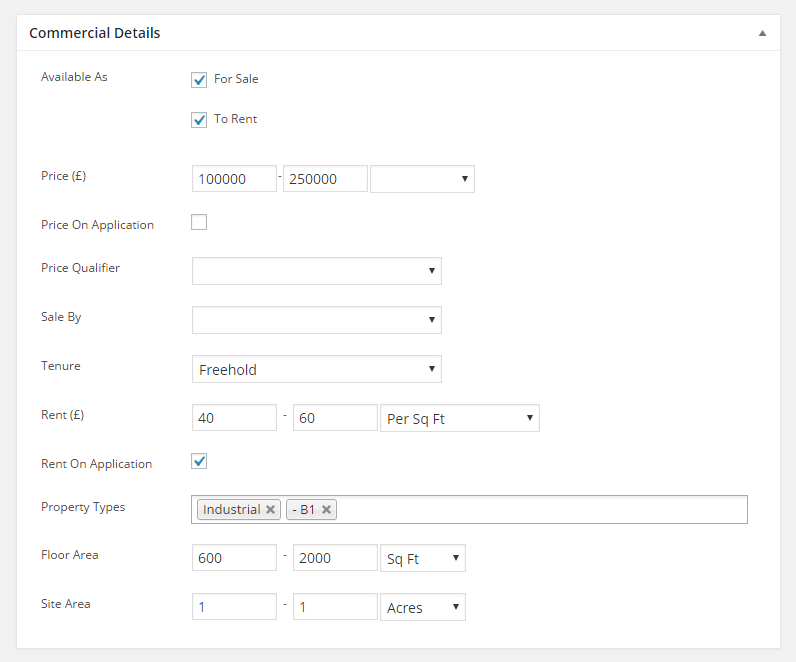 Unlike residential where you set a fixed price, in commercial you can enter a range which will then be displayed to your users. – Multiple property types. Commercial properties can consist of multiple property types, for example ‘Warehouse and offices’. We support this allowing you to categorise the properties into an unlimited number of types, all of which can be customised in the ‘Settings’ section. We’ve already got a list of agents interested in using this feature and can’t wait to start showing you the results of what we’ve been able to achieve. As always, we really appreciate feedback and would love to see examples of sites you’ve built using Property Hive. If you’re updating from a previous version it’s worth noting we made one small change to one of the templates: single-property/rooms.php and related actions are now deprecated and single-property/description.php should be used instead. If you haven’t modified these in anyway there should be no changes required.